Some staff of the National Assembly on Tuesday morning went wild in celebration over a failed attempt to impeach the Senate President, Dr. Bukola Saraki and his deputy, Ike Ekweremadu. The Department of State Services, DSS and other security agents earlier in the day blocked the entrance to the National Assembly. Some APC Senators allegedly camped at a top hotel. The development was alleged to be part of the plot to effect a change of the Senate leadership on Tuesday. The pro-Buhari lawmakers were said to have move to Sheraton Hotel to carry out the impeachment process. The incident has since generated a lot of controversies as members of the Peoples Democratic Party, PDP, where at hand and eventually frustrated the impeachment plot. 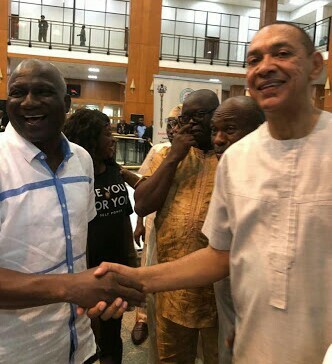 Some staff and supporters of the Senate President were seen dancing and singing that the alleged attempt to change the leadership of the National Assembly had failed.